The Jim Wolf Equal Justice Award recognizes a Nebraskan who has made significant contributions to justice for all throughout his or her career. The award is given in the spirit of the late Jim Wolf, a founding Appleseed board member who possessed a lifelong dedication to promoting the common good. The individual should be someone who, like Jim, stepped outside of the comfort of their day-to-day lives and, without thought for their own economic or political gain, devoted themselves to public service to benefit the common good while heeding the call to respond to adversarial and difficult circumstances facing others. This year, Appleseed is incredibly proud to recognize Kathy Bigsby Moore with the Jim Wolf Equal Justice Award. Kathy Bigsby Moore will receive the 2016 Jim Wolf Equal Justice Award. In a career that spans three decades, Moore has been a tireless advocate for low-income children and families in Nebraska. 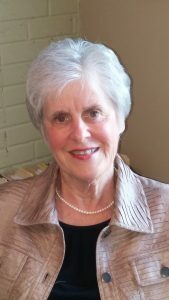 Her encyclopedic knowledge of child welfare and her reputably sound insight is matched doubly by her heart for vulnerable children and her dedication to her work. “There’s no question that Nebraska is a more supportive place for low-income children and families because of Kathy’s work,” Nebraska Appleseed Executive Director Becky Gould remarked. For 23 years, Moore served as Executive Director of Voices for Children in Nebraska, which she founded in 1987. During Kathy’s tenure, this independent, nonprofit organization created a health coverage program for thousands of low-income Nebraska children, increased adoption options for hundreds of Nebraska children, developed linkages between services for abused children and adult victims of domestic violence, including those entangled in divorce and custody proceedings, increased opportunities for families to leave poverty and become self sufficient, and restructured and improved many of the child welfare and juvenile justice services in Nebraska. Moore’s firm sense of ethics and her compassion extended to all aspects of her life. She and her husband served as foster parents to more that 30 children – an experience that inspired her to found Voices For Children. She has served as a mentor and role model to countless social justice advocates and leaders in Nebraska who have now taken up her important work, including Appleseed’s own Becky Gould. “She is somebody who I’ve always admired in terms of how she led Voices and built the organization. Her ethics and how she carried herself through the work. If we had more Kathy Moores, think of how great Nebraska could be,” Gould said. Nebraska Appleseed is honored to recognize Kathy Bigsby Moore for the incredible difference she has made for children and families in Nebraska. Her legacy is one that has changed our state for the better.